‘Tis the season to be Merry and Bright! With that said, as exciting as the holidays are for many of us, they are also a time of stress, and hustling and bustle. Combine that with kids and preparing for the Christmas season can make things a bit crazy for some families. Of course in an ideal world, it is much more appealing to leave children at home while you take on your Christmas shopping, but it’s simply not a practical option for everyone, and thus sometimes children will need to tag along. The good news is that having a game plan before you head out will save you headache and unnecessary stress. Young children can sometimes be needy with short attention spans; this is simply an age thing and not meant to be negative. With that said, if you’re planning a pretty thorough shopping excursion that involves a variety of stores in the mall, why not bring some toys or props with you? For instance, do they have any special treats you allow them to have once in a blue moon? Include these in your bag to hopefully curb possible meltdowns that could otherwise take place. Why not also pack some books to keep your child occupied while you are in the checkout line or change room. If you pack strategically, you should have enough items to keep your little ones busy and focused while you buckle down and check some names off your shopping list! That is the goal after all. Children love to feel helpful! Prior to heading out for those groceries, come up with a short list of basic items they can handle locating for you (milk, eggs, bananas) Another simple idea that can be quite effective is to print out a shopping bingo card or something very similar, and that way shopping turns into a fun game they want to be a part of to complete their bingo card. Reward them with something small after if you choose! Similar to the point above, anything that you can turn into a game is a bonus. Play a game such as I Spy with your kids or make up your own games as you carry on with your day. Even better; if you have more than one child with you, think of a game that would be entertaining for them to play with one another, and encourage them to play it with each other. While it may originally come across as counter intuitive to willingly increase the number of children you bring along, it can definitely help the situation especially with older kids. If your child’s biggest complaint is being bored while you shop, having a friend with them they can chat and to and joke around with will make the world of a difference. Shopping malls aren’t just flooded with stores they are also full of food, video arcades, coin-operated ride-on toys, and indoor playgrounds if your mall has the space! Sure you may prefer to get things done as fast as possible with your kids, why not keep them happy and content by allowing them a play break. Happy kids mean happy shopping! 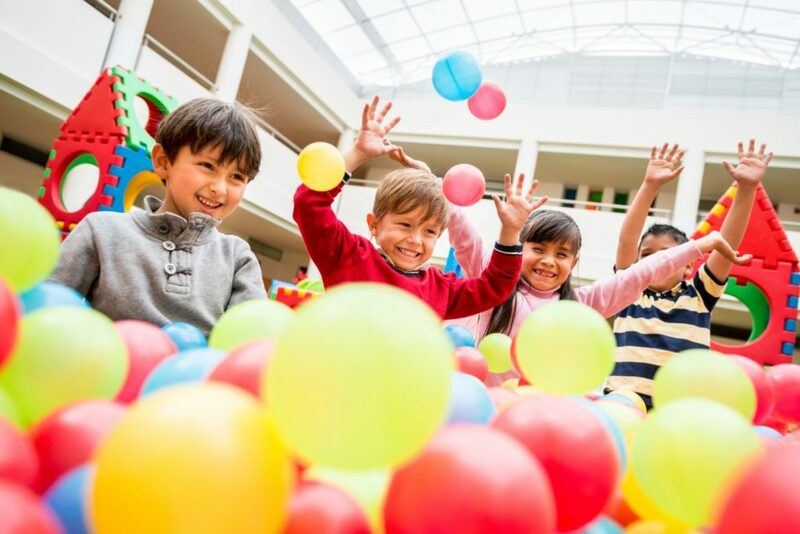 Indoor playsystem are found throughout many malls, and at SPI we are proud to work with shopping malls as they expand to include play areas for young children. Let your kids’ burn off some energy in a safe and controlled playsystem that is also convenient while you get your holiday shopping done!